Fill a shallow baking dish with vegetables, pour in a creamy sauce loaded with cheese, bake until bubbling and crispy on top and voila – you have a gratin. This classic French technique produces some of the most delicious sides and accompaniments you can get, and a good gratin can easily steal the limelight from the main attraction on the plate. Our collection of gratin recipes covers everything from the simple to the complex – and everything in between. 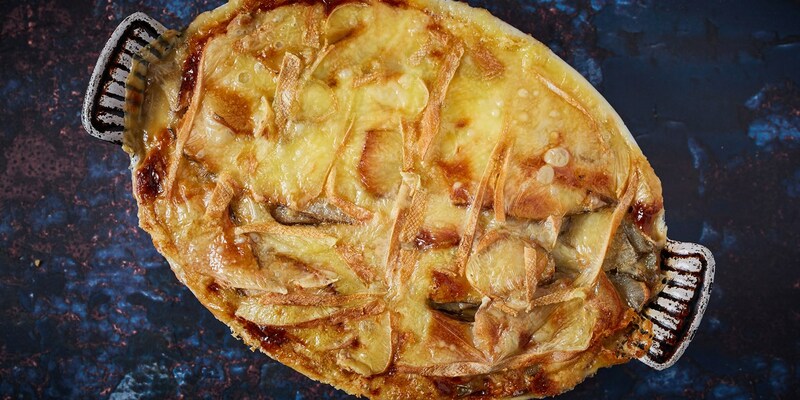 Get to grips with Potato dauphinoise (the poster boy for gratins everywhere) before moving onto more unusual combinations such as Paul Welburn’s decadent Truffled Jerusalem artichoke gratin or Anna Tobias’ Turnip and anchovy gratin. For a real treat, try your hand at Andy McLeish’s Black truffle and Parmesan gratin or shell out for Will Holland’s Lobster and caviar gratin served in the shell. Not all gratins have to be full of cream, either – try William Drabble’s Tomato, courgette and aubergine gratin for a lighter, fresher, more Mediterranean take on the classic. Gratins are simple to prepare but it helps if you have a mandoline to slice the vegetables thinly. You can also cook certain varieties of gratin (such as dauphinoise) in advance, before transferring them to the fridge with a weight on top to create dense, structurally sound blocks of delicious goodness that just need reheating before dinner.